Mitchell Gallery Exhibition Schedule 2003-2004. Exhibitions include: Out of the Shadows: The Paintings of Helen Torr, a Retrospective; Rembrandt: The Consummate Etcher and Other 17th Century Printmakers; Exotica: Plant Portraits from Around the World; St. John's College Community Art Exhibition; and Anne Arundel County Juried Exhibition. 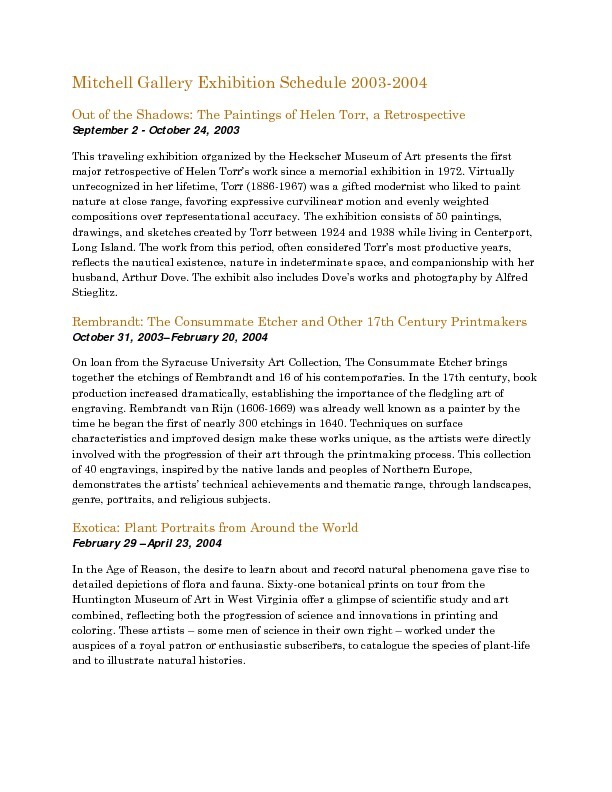 Mitchell Art Gallery, “Mitchell Gallery Exhibition Schedule 2003-2004,” St. John's College Digital Archives, accessed April 24, 2019, http://digitalarchives.sjc.edu/items/show/2701.